Pastor Michael Reese: An Outcast on "Castaway Island"
I like the way Bro. 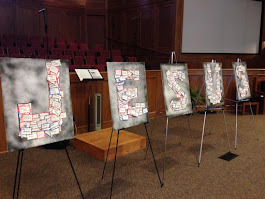 James listed the "front and back flap" of the Sunday School books on his blog page. "The front and back flap" is my way of referring to the "21" of the things "most assuredly believed" among us. Is it possible for a preacher or a church for that matter to be KJV and rock solid on the "21" and still be an "outcast" in other churches or other pulpits? Are there some other beliefs (outside of the "21" and the KJV) that if a church or preacher does not adhere to that makes him or that church UNSCRIPTURAL or unfit for other so-called "scriptural churches?" This will open a can of worms that anybody can fish with for awhile. In my humble opinion, yes...a preacher or church can be an outcast or at least "suspect" for several reasons. If you read authors who are not "ABA" or even dare quote them, you are "suspect" to some. If you proclaim the gospel (even occassionally) through some other media than a man in a tie, you are suspect to some. If you (the church) omit one of the three standard services for ANY reason, you are suspect to some. If you have ever talked to, breathed the same oxygen, or heaven forbid, attended or preached at a BMA/Southern Baptist/ Independent Church, to some people you are suspect or perhaps a castaway. Over-indulgence in any of these areas is a concern, of course. At times I have been "Wilson"...drifting away from what's normal or expected. At other times I have been the one trying to call somebody back to tradition and I shouldn't have been doing so. Over-indulgence will lead one to a state of regret, a desperate search for relief and will eventually lead one to publicly behave in ways offensive to others.